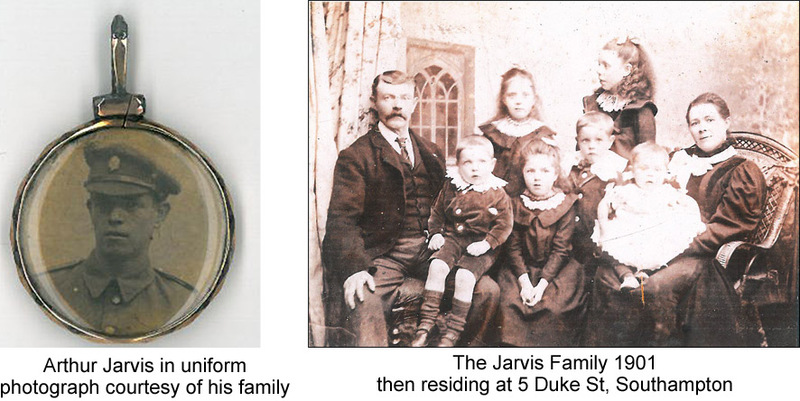 Arthur’s father, John Jarvis, was in the army from 1880 – 1886. He was a private in the Rifle Brigade, based in the Winchester barracks. He married Mary Smith in Winchester in March 1886. When John left the army they moved to 5 Duke Street, Southampton where John took employment in the docks. Family photo 1901: Standing from the left is Florence (aged 9), Mary E (aged 12). Seated from the left is their father John (aged 40) with George (aged 3) sat on his knee, Annie (aged 7), Arthur (aged 5), Harry (aged 1) sat on the lap of their mother Mary (aged 40). James (Jim) was 15 and away at sea in the Merchant Navy. Before joining the Royal Inniskilling Fusiliers Arthur was in the Army Service Corps. Arthur has no known grave but he is commemorated on the Cambrai Memorial, Louverval, Panels 5 and 6. Medals awarded to him posthumously include the 1914-18 War Cross, 1914-18 War Medal and Victory Medal. Researcher: Carol Masters, Arthur’s Great Niece.